Dolphins halfback Jay Ajayi (23) has averaged 121.6 rushing yards per game over their current six-game winning streak. With three quarters of the season in the books, we wanted to follow-up on our midseason divisional report and examine how each conference and its divisions stacked up against each other. Unsurprisingly, we again find the AFC West (2.74) holding fast to its claim as the strongest and most competitive division in the NFL according to our data. The Raiders (9-2) and Chiefs (8-3) both currently inhabit our latest BES Top-10. Meanwhile, the Broncos (7-4) are 13th in BES Overall. One loss by any of the three could dramatically alter the AFC West standings. The Chargers (4-6), despite being in last place, own a non-divisional record of 4-3 and boast the No. 2 BES Defense. They will have a chance to be spoilers as they host both the Chiefs and Raiders in the season’s final three weeks. 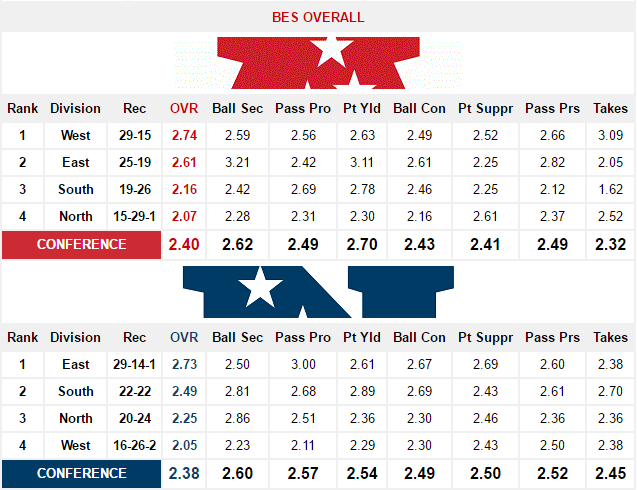 The NFC East (2.73) remains the strongest in the conference, narrowly edged by the AFC West for the top BES Overall score in the league. The Cowboys (10-1) have extended their win streak to 10 games and have been the No. 1 team in the BES for four consecutive weeks . The Cowboys are joined among the BES top-15 by the Giants (8-3) at No. 4 and the Redskins (6-4-1) at No. 12. The Cowboys will have an opportunity to avenge their lone loss on the season when they face the Giants on the road in Week 14. The loss of Patriots tight end Rob Gronkowski (back) for the remainder of the season looms large in AFC East where the Patriots (9-2) hold a two-game lead on the surging Dolphins (7-4). The Dolphins are the only team currently ranked among the top-10 in BES Overall (No. 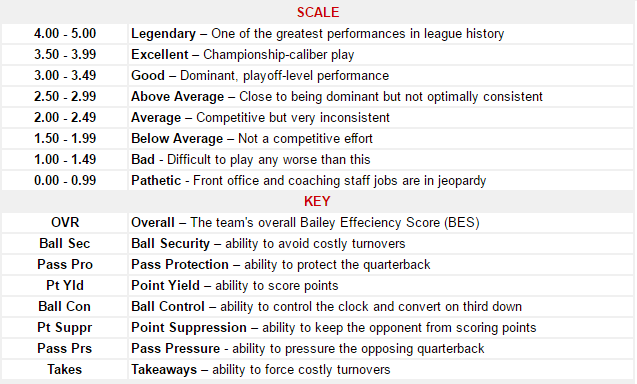 6), BES Offense (No. 7) and BES Defense (No. 3). They will host the Patriots in Week 17 in a game that could decide the Champion of what is presently the third-most competitive division in the BES. Its a tall order to digest we need to chew the falcons on our plate first. I kinda wish we would get over the conservative play calling and throw down field. Other teams seem to do it fine, so why can’t we? Alex smith isn’t accurate enough. Keep dreaming. We all are. I know just my sense of humor. Getting Charles back in time for a run would be huge, he’s a difference maker! Kelce has been inconsistent at best this season and Maclin wasn’t playing well before his four week hiatus. And the Albert Wilson project needs to be scrapped all together!